The most tangible evidence of Kingston General Hospital's former role in nursing education is the Ann Baillie Building, now home to the Museum of Health Care. Designed by Kingston architect William Newlands and known as the Nurses’ Home, the hospital erected the residence in 1903-4 as the first permanent accommodation for nursing students. Intended to house 26 nurses, it replaced earlier accommodations in the hospital itself, close to the wards and possible contagion from patients. The Nurses’ Home is situated facing Lake Ontario rather than the street, thus affording what must have been a sweeping view of the water. This impressive beaux-arts-style limestone building with its commanding columned portico and high ceilings was meant to attract respectable, unmarried young women to nursing and to assure parents that their daughters would be adequately supervised. A student’s residence room was her refuge, her home away from home. She and her classmates lived, studied, and worked together for the duration of the programme. The residence became the centre of camaraderie, commiseration, and the beginning of life-long friendships. Within a few years the nursing school had outgrown the residence and the student overflow was once again accommodated in other hospital buildings. To overcome this space shortage, in 1927-8 the hospital constructed a new 150-bed Nurses’ Home at the corner of George and O’Kill streets as an addition to the original 1904 building. The new structure featured a beautiful reception room and lounge, a library, a sun room, and a large classroom in the basement. Generations of KGH nursing graduates have fond memories of this 1920s building. In 1942 it was renamed the Ann Baillie Residence in memory of the much loved nursing school superintendent (1924-42) and member of the 1910 class. A KGH student often began her career as a resident of the 1904 Nurses’ Home. Probationary students where frequently housed on the second floor of the building and in later years would move into the Ann Baillie Residence next door. It was likely no coincidence that the school’s supervisors lived one floor below the “probies”. As the student population continued to grow, other temporary and long-term nursing education buildings joined the Ann Baillie Residence. Students learning to nurse patients with contagious diseases lived in the 1923 Kingston Isolation Hospital on King Street. In the late 1940s the hospital acquired a mansion down the street on King for the use of graduate nurses working at KGH. Called Calvin House, the hospital expanded this building in 1956 for 54 student nurses. In 1969 all KGH nursing students moved into the modern high-rise residence, now known as Waldron Tower. Newly constructed on the site of the original Calvin House mansion, the building was designed to allow a view of Lake Ontario from every bedroom. This structure served as residence until the school’s closure in 1973. 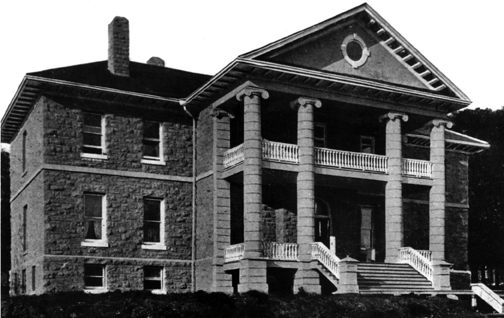 After the hospital demolished the 1928 Ann Baillie Residence wing in 1992, the Ann Baillie name was applied to the original 1904 Nurses’ Home. Now designated a National Historic Site in 1998, the Ann Baillie Building continues as a symbol of the nursing profession’s struggles for recognition and nurses’ contribution to health care in the community and hospital.